National Museum Wales has raised the £557,218 necessary to keep William Dyce’s 1860 oil painting Welsh Landscape with Two Women Knitting which has been unveiled today. The National Heritage Memorial Fund and the Art Fund each contributed £166,000, with the balance coming from one major private donor and nearly 150 other individual contributors. 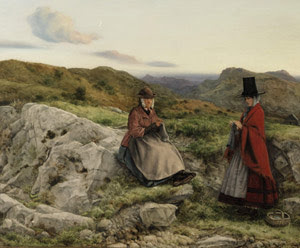 The painting depicts the rugged Snowdonian landscape with two women in distinctive Welsh dress knitting. The older seated woman is wearing everyday clothes, while the younger standing figure is wearing a traditional Welsh dress of tall hat, apron and red cloak. Last year former Culture Minister Margaret Hodge placed a temporary export bar on the piece to provide an opportunity to keep it in the UK. She argued that the painting was of outstanding aesthetic importance, an important representation of Welsh landscape and culture in the 19th Century, and a significant Pre-Raphaelite study. William Dyce (1806-1864) was born and brought up in Aberdeen and considered careers in medicine and the church before deciding to become a painter. He studied in Rome in 1825-6, and returned to Italy in 1827-8. While there he was influenced by the art of the Nazarenes, a community of German painters based in Rome, whose interests in reviving Renaissance art, early religious music, and theology closely mirrored his own developing tastes. Dyce settled in Edinburgh in 1830 where he worked as a portrait painter especially of women and children. He also became increasingly interested in naturalistic landscape painting especially of Scottish highland subjects. In 1837 he moved to London and became Head of the newly established Government School of Design (later the Royal College of Art), and although he resigned in 1843, the Victorian ‘South Kensington system’ of Art education was largely based on his ideas. Until now, Dyce was not previously represented in the collections of Amgueddfa Cymru. Having been quite unwell with a liver complaint, Dyce and his family visited Wales in 1860. They stayed for six weeks in a hotel in Llanrwst on the river Conwy, hoping that the ‘change of air’ might speed his recovery. In the event, the trip to north Wales also turned out to be of great value to his career and legacy. Other changes of air had proved to be both productive and lucrative. Pegwell Bay, which now resides in the Tate Gallery, was produced on a trip to Ramsgate two years prior to his visit to the Conwy Valley. It originally sold for £400, which would be about £34,000 now. A Scene in Arran, made the following year, sold for £620 or about £53,000 today. Aside from the fiscal benefits of working whilst ill, it is clear from his letters that he fell in love with the Welsh landscape, and painted it not just to make money. He accounted for the landscape’s appeal by describing in a letter the contrasts it presented between “rugged wildness and woodland richness”. Snowdonia and the Conwy valley had been highly popular destinations for Victorian artists. The hamlet town of Betws-y-coed, which is only a few miles away from Llanrwst, has been described as ‘the first artists’ colony’. David Cox, Benjamin Leader and Henry Clarence Whaite all visited these parts of north Wales in the latter half of the 19th Century. Dyce was a supporter of the Pre-Raphaelite’s mission to revive British art, and adopted their technique of painting on location. However, while he sketched the landscape on location, it is likely that Welsh Landscape with Two Women Knitting was created when he returned to his London studio. While it remains an important example of Pre-Raphaelite painting, with meticulous attention to detail, it’s representation of Welsh culture is a matter of some controversy. It has been noted that Welsh women used to collect wool from hedgerows and spin it into yarn to be knitted in garments. However, by 1860 the custom had largely disappeared, and would almost always have been done in the home. The younger girl’s costume also raises questions. In the 1830s Lady Llanover revived the wearing of the tall hat, apron and red cloak and made it the Welsh national dress. However, it was only worn on special occasions or for churchgoing on Sundays. It would have been rarely, if ever, seen is an outdoor location such as in Welsh Landscape with Two Women Knitting. ‘This painting is… a moving meditation on the passage of time. It is an important depiction of Welsh culture, recording a traditional way of life which was in danger of dying out”. While the painting is undoubtedly an artificial image, Dyce may have deliberately composed it in such an unrealistic manner. One way or another he was he was either celebrating a rural Wales still untouched by progress, or ensuring the painting’s saleability in London by the use of clichéd images of Welsh life. Arguably it was a bit of both. Whether the painting is ‘true’ or not, it is certainly reflective of commonly held view in the mid 19th Century that north Wales was behind the times. It is interesting that this painting was created while Dyce was struggling with his own acceptance of scientific progress, and the conflict between it and his religious beliefs. It is possible that he composed this piece, with its factually inaccuracies, as a manifestation of his own desire to preserve the past and remain ‘untouched by progress’. The painting raises a number of issues around Welsh heritage and identity. It may also point to the popularity of a London metropolitan view of Wales as a place untouched by progress. Perhaps the people of London hankered after portrayals of a return to ‘the simple life’, even if they represented inaccurate and illusory visions. This was a perfect choice as it is Knit in Public Days through the 20th!